Morgan Alexander's Amocat Cafe opens today after plenty of elbow grease from the man himself, friends, and family. Amocat had their unveiling as a completed coffee shop Saturday and the rooms packed full of supportive people is a good sign Morgan has tapped into something truly worthwhile. The frontage just next door to the Mix there on St. Helens will make for a relaxing place to hang out, have small meetings, and even gaze at some art while enjoying as much local stuff as Morgan can bring to customers. If anyone cares to join in I'll be stopping by for a bit after work about 5pm or so. Congrats Morgan and thanks for bringing one of your dreams to life and to Tacoma! by Erik on 6/1/2010 @ 9:28am Very cool! "Had my first cappuccino at Amocat Caf� today, on my way to work. Delicious. Nice job on the foam and a great custom roast from Valhalla. A really nice space. And it�s Morgan Alexander�s first day. This is an email to encourage all of you to check it out. And you might want to bring cash, as the card reader folks don�t have him connected yet." by KevinFreitas on 6/1/2010 @ 12:33pm Here are pics from my visit still in progress! Alrighty, time to get working! by Altered Chords on 6/1/2010 @ 2:54pm Congratulations Morgan! The place looks great and I understand there is artwork being hung there now? Great hours for moms though, if I remember what they are next time and don't show up just after closing. The latte was delicious, I could definitely tell it was Valhalla. by Erik on 6/1/2010 @ 3:57pm Nice pictures Kevin. Great seeing you again Jen. I am reminded of the Tacomic you both starred in years ago. by L.S.Erhardt on 6/1/2010 @ 4:13pm My next day off is Friday (yeah, those 84 hour work weeks will wear you down). I'll have to stop by and see if the hot chocolate is worth the hype. by morgan on 6/1/2010 @ 9:20pm That was fun! So good to see everybody today! Card reader update: they said they are shooting to be out Wednesday or Thursday to hook me up. It's amazing anything takes more than 24 hours these days! Hours: I'm finding I have tons of stuff I *should* have done before opening - but I couldn't wait! Extended days and hours for the shop will be happening soon though. by Erik on 6/1/2010 @ 11:10pm That was awesome Morgan. Good job on your first day. Get some well deserved rest tonight. We will see you tomorrow. by Nick on 6/2/2010 @ 10:19am Congrats Morgan! Can't wait to check it out! I think you've nailed a solid location too - I remember living over there and seeing the entire stadium district walk down St. Helens to get to work downtown. You should get a nice steady flow of customers in the morning. Stop by the new Amocat Cafe at 625 St Helens, Tacoma and see my new art show and have a cup of coffee. Amocat is a just opened coffee cafe and looks like it has a great future. My paintings are bright, bold and a variety of subject. Meet the owner Morgan Alexander and get out of the rain. 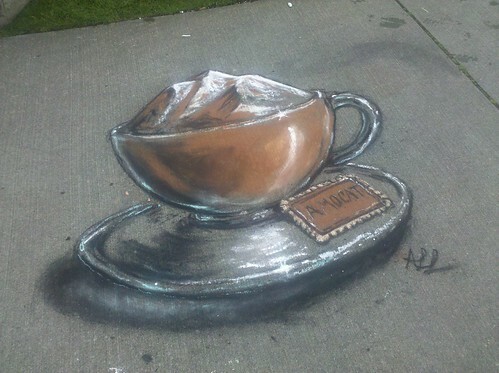 by Maria on 6/2/2010 @ 3:15pm Amocat...a man, a plan, a mocha...Tacoma! Congratuations!! I love to see a beautiful new place to get good coffee, plus a place for art, music, events, people to hang out. I drove by here the other day, but didn't realize it was on St. Helens. Are you right next to the Mix? by Maria on 6/2/2010 @ 3:34pm Sorry, I saw it said above, "The frontage just next door to the Mix there on St. Helens..."
A taiku by Altered Chords. by KevinFreitas on 6/2/2010 @ 4:46pm @Altered: You totally beat me to that! I thought the same thing when I read Maria's first post. Well done! by captiveyak on 6/2/2010 @ 9:29pm No, the limited hours are only temporary. Extended hours will be posted soon! by intacoma on 6/3/2010 @ 7:36am just stopped in, good to see some familiar faces. The place is coming together nicely, especially like Morgans collection of old Tacoma memorabilia. by fredo on 6/3/2010 @ 7:56am Is there an adults only area, or are there always boys wrestling on the floor? fredos family will be visiting the amocat. we support local business and wish Morgan and his staff the best of luck. by the way, great pictures Kev. Looks like the Amocat will be the new city council "think tank"
by Erik on 6/3/2010 @ 9:11am Glad to see that the original Stowe art has now been placed in the glass case for safekeeping. by Dave_L on 6/3/2010 @ 1:44pm At the event I heard the suggestion that the side room would make a great kids' room. Or will it be an adults-only kind of place? jk - I now it will always be adult and kid-friendly. Some of the best places in town welcome well-behaved kids. Mad Hat, Villa Caffee, Mandolin, Rosewood, et al. You know, that floor-wrestling idea might warrant further exploration. by fredo on 6/3/2010 @ 9:51pm I wouldn't mind seeing Marty Campbell take on Ryan Mello in the Amocat "Octagon." Pretty sure marty could open a can of whoopass on ryan. by NineInchNachos on 6/3/2010 @ 9:58pm how much for some Chris Sharp signage? by Dave_L on 6/4/2010 @ 8:59am Amocat Octagon, heh-heh. I plotted a different course this morning to check out Amocat. Thanks for the morning drink, Malory and Morgan! I love the decorating since last Saturday�s gathering. We now have sandwiches, salads, and more! By our friends over at Europa Bistro in the Proctor District. Already progress. Can't wait to come by for lunch and am looking forward to once the beer and wine menu is setup! by morgan on 6/10/2010 @ 10:47am After slight delay, we have Mad Hat tea in too!